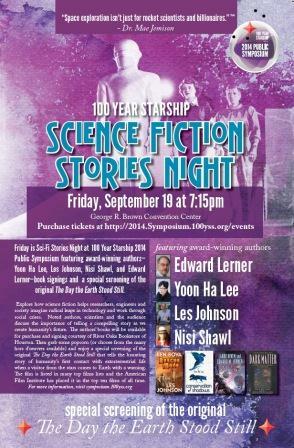 The 100 Year Starship 2014 Public Symposium boasts two explicitly science fictional programs. And don’t ask how that’s different from the rest of the conference — remember, the people going don’t think starships are fictional. The Symposium takes place in Houston from September 18-21. At the end of Friday’s program attendees can unwind at Science Fiction Stories Night. Following a book signing featuring SF authors Yoon Ha Lee, Les Johnson, Nisi Shawl, and Edward M. Lerner there will be a screening of the original The Day the Earth Stood Still. Space is a very unforgiving environment and a deep space journey, which may take decades is one in which it may be impossible to carry every critical spare or replacement part needed, and that is where steampunk comes in. We exist to make the capability of human travel beyond our solar system a reality within the next 100 years. And Mae Jemison of the 100 Year Starship Trust knows why they picked 100 years. If you said ten years — ‘Nah, we know that’s not long enough.’ If you said 500 years, people would say, ‘I can kick back for another two to three hundred years because I don’t have to worry about it.’ One hundred years is close enough.